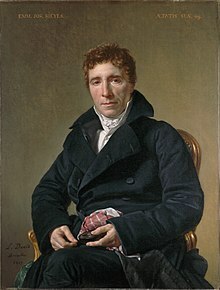 Emmanuel-Joseph Sieyès (3 March 1748 – 20 June 1836), commonly known as Abbé Sieyès, was a French Roman Catholic abbé and clergyman, one of the chief theorists of the French Revolution, French Consulate, and First French Empire. His liberal 1789 pamphlet What is the Third Estate? became the manifesto of the Revolution that helped transform the Estates-General into the National Assembly in June of 1789. In 1799, he was the instigator of the coup d'état of 18 Brumaire (9 November 1799), which brought Napoleon I of France to power. After the Reign of Terror, when asked what he had done during that period; variously reported in Hoyt's New Cyclopedia of Practical Quotations (1922), "Life", p. 453; "War", p. 857. Voting for the death of Louis XVI; denied by Sieyès—he no doubt voted "La mort", "sans phrase" being a note on the laconic nature of his vote, i.e. without remarks. The voting usually included explanations of the decision. Reported in Hoyt's New Cyclopedia of Practical Quotations (1922), "Death", p. 178. Une nation de singes à larynx de parroquets. Note to Mirabeau, speaking of France, reported in Hoyt's New Cyclopedia of Practical Quotations (1922), "France", p. 294. This page was last edited on 7 December 2018, at 22:14.